Illustration Commissions and commercial projects. Here is a selection of my commissioned work, it features a range of different illustration and design projects I have undertaken. To get in touch regarding a commission please send me a message via my contact page. Having worked with Southbank Centre on a number of previous projects, I was really pleased to be given the opportunity to be asked to illustrate the Hayward Gallery as part of the 2018 re-opening of the space. The project, which involved hand-printing a limited edition screen print of my artwork, was a real privilege to be part of. 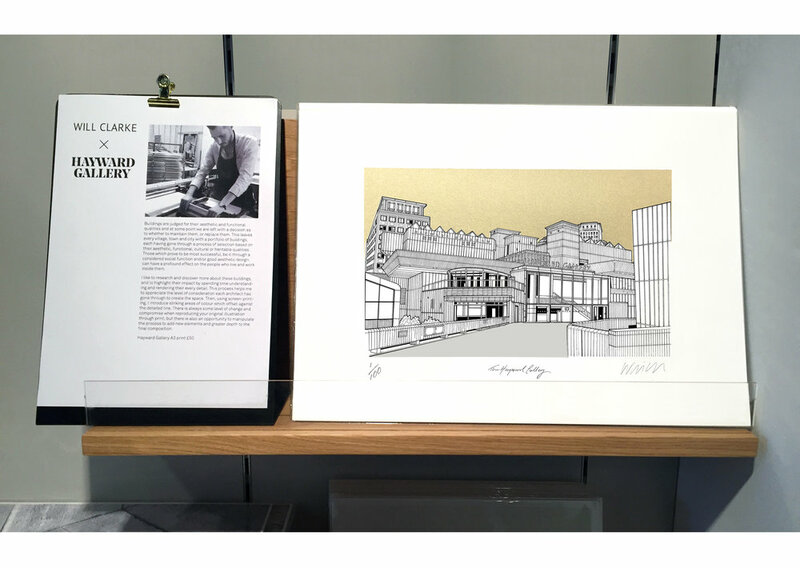 The print is available through the Hayward Gallery shop and my own online print shop - Hayward Gallery screen print. 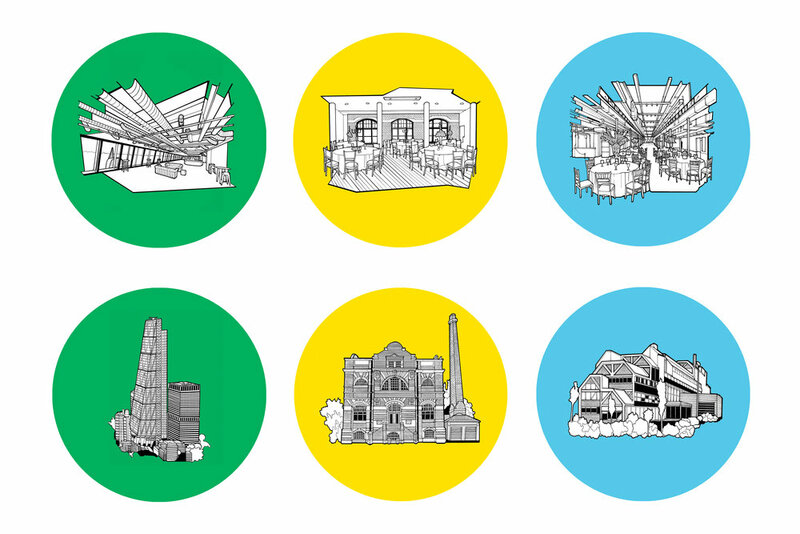 Above is the Hayward illustration starting to take shape. Following a long and successful partnership with We Built This City, Carnaby St, it was great to collaborate in creating a hugely successful solo show. 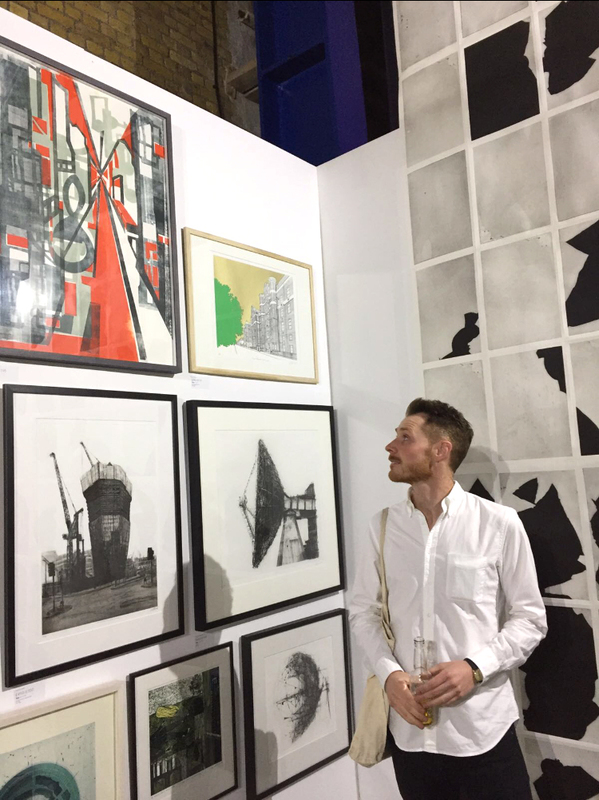 The show ran for ten days, attracted large numbers of visitors and gave me a rare opportunity to curate a gallery space and display an extensive range of my artwork. My intention in undertaking this project was to bring people closer to the printmaking process and understand how my artwork is made. Throughout the event we held live printing which allowed for people to print their own tote bag with my unique design of Carnaby. I was kindly asked to illustrate this famous old London pub for a couple’s anniversary present. The couple used to live opposite the pub in the house with the blue door, so this illustration holds a significant emotional attachment. The pub is an iconic London landmark, famous in summer for it’s beautiful array of flowers and hanging baskets. It proved difficult to gain a good vantage point in which you could see both the pub and the flat, so in the end I resorted to taking a quick photo from the upper deck of a bus as it drove past! Thankfully this gave me the perfect view from which to work. I decided that this project should be entirely hand-produced, so I used gouache paints to add the splash of colour and fine pen-work to complete the image. The final piece was sent over to the United States, where the couple are now based. I illustrated a series of event buildings on behalf of Venue Lab. Each space is used by the company to hold international events and live shows. Unusually for me, I was asked to illustrate both the interiors and exteriors of the buildings. I really enjoyed illustrating the intricacy of the inside of the venues and it made for a unique set of illustrations. The commission was to illustrate three venues, each with one illustration of the interior and one of the exterior, the full set is below. The colours used formed part of Venue Lab’s brand identity. 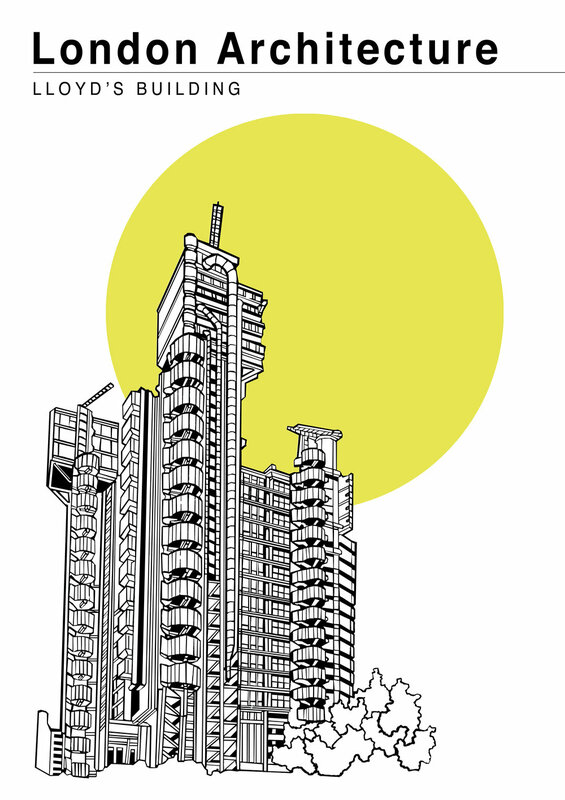 Below is one of the final illustrations of the interior of the Printworks Venue. I was asked to illustrate a scene of which included the Eiffel Tower and surrounding area of Paris. The final piece was all hand-drawn and I screen printed a single layer of gold ink across the sky. The detailing which forms the leaves of the Sycamore Tree was a particularly enjoyable part to illustrate. With permission, I have now made a limited edition print run of the picture of 50. 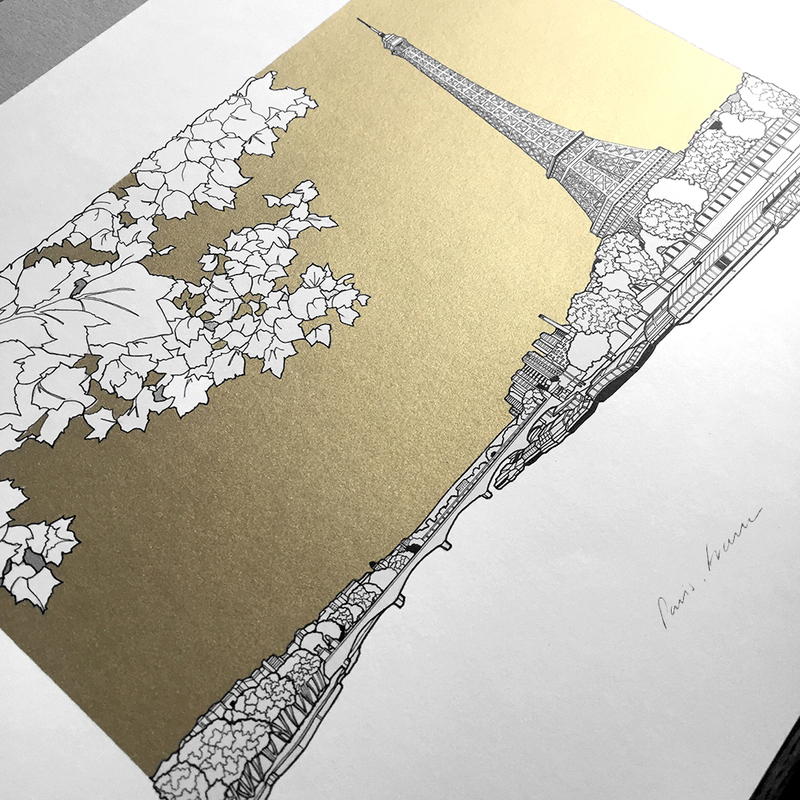 These prints are available through my print shop - Paris, France screen print. 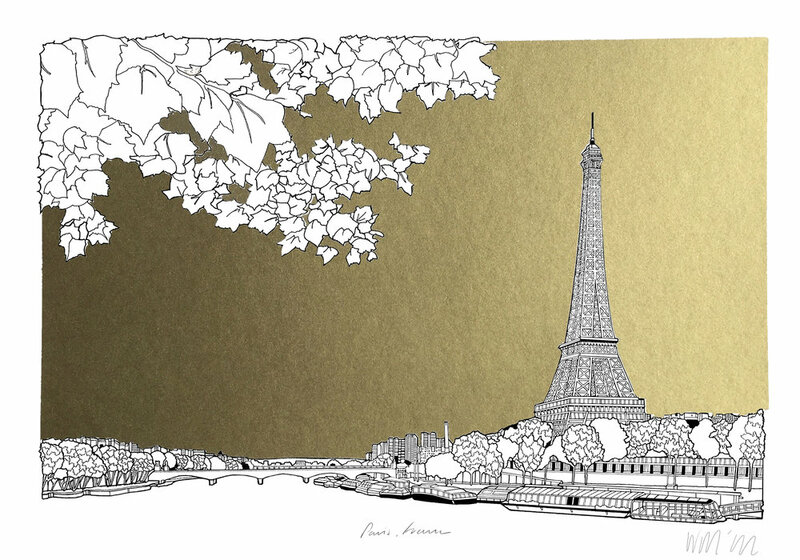 Below is the final piece which features a view from the River Seine, Paris. Following past successful collaborations with Habitat and East End Prints, I have recently been asked to design a series of poster artwork to be on sale at Habitat’s London stores. 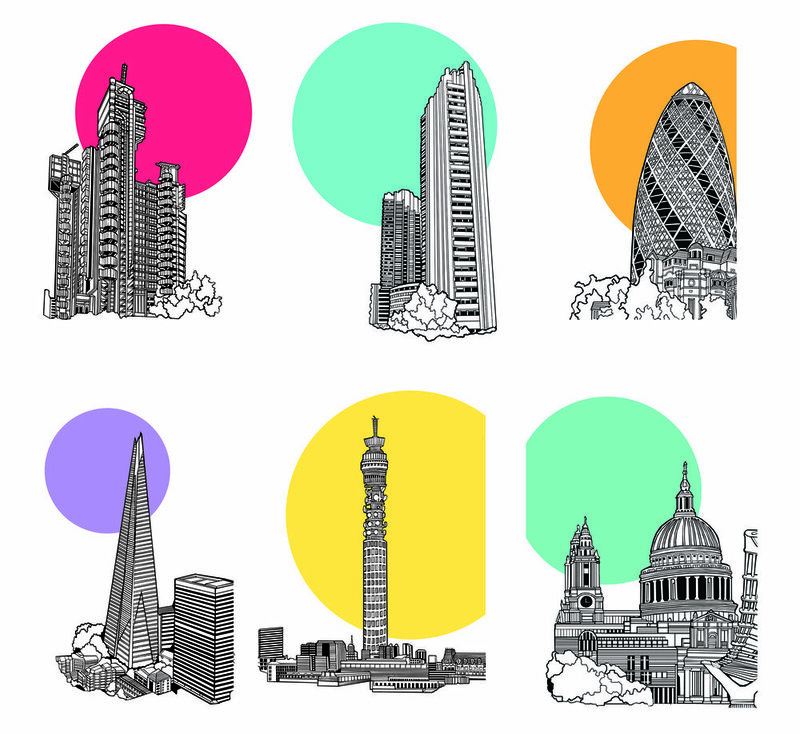 These designs are all to be large format and will be a series of iconic London landmark buildings. The release date for this series is yet to be confirmed, but you can anticipate them in store in, or around Christmas 2018. I was asked to illustrate the beautiful riverside walk in Thames Ditton, Surrey. This piece was a given as a present for a father’s birthday present and it features his daughter and their dog paddling in the river opposite Hampton Court Palace. 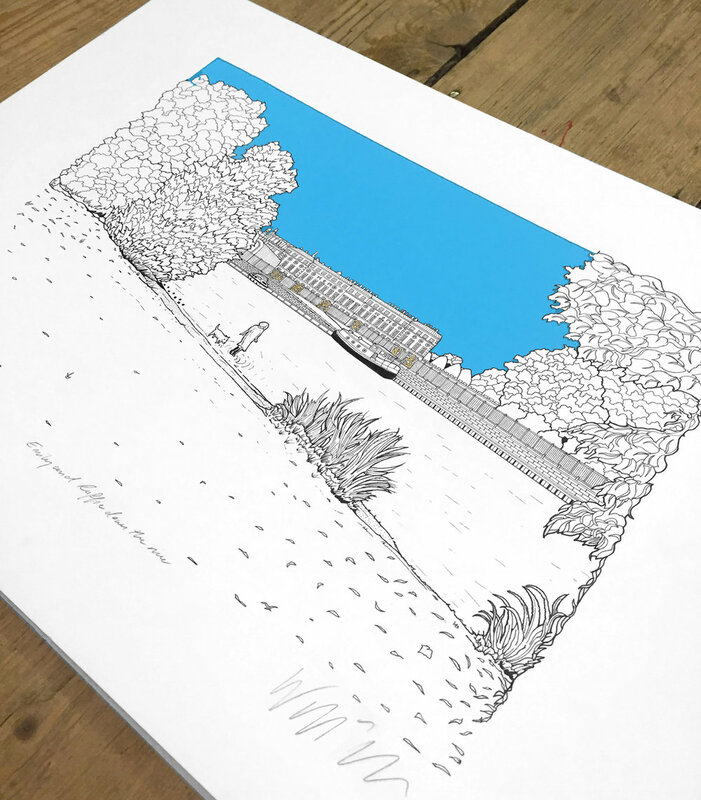 The piece is all hand-drawn with the blue sky screen-printed directly to the original. I then applied gold leaf to the gates of Hampton Court. I have been fortunate to have worked with the Royal Brompton Hospital Trust over the past few years. Together, we have been able to raise money for the trust through print sales and auction events. I was also commissioned to install a series of my framed pictures throughout the Fulham Wing, which is on display for the foreseeable future. 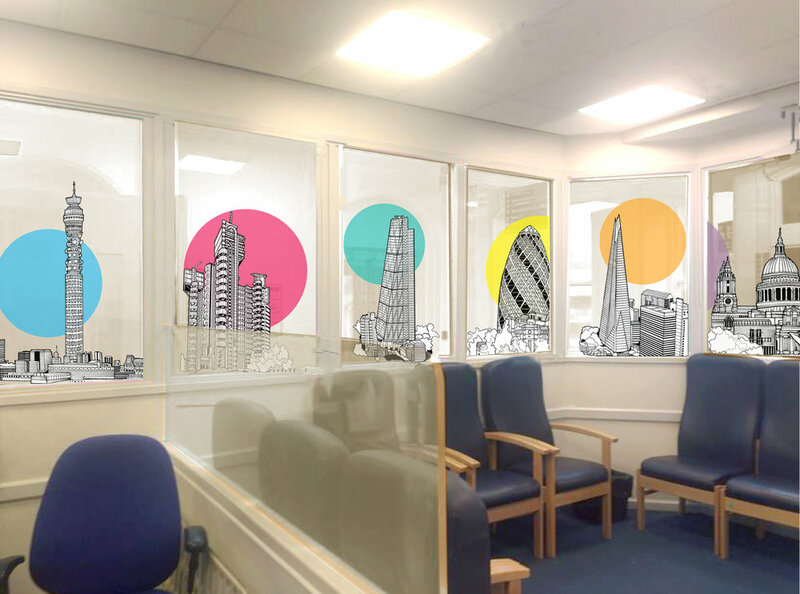 In the most recent addition to this collaboration, I have designed a series of window pieces for one of the hospital’s waiting rooms. The art department in the hospital were keen to introduce a splash of colour into the otherwise purely functional space. Below are the final designs. Below is the waiting room with window designs in place. The artwork was designed to be semi-transparent in order to allow for light to still enter the space. I was selected for the 2017 edition of the Woolwich Contemporary Print Fair. This was a real privilege for me and although I couldn’t enter the 2018 edition, I will be working towards a new entry for 2019. 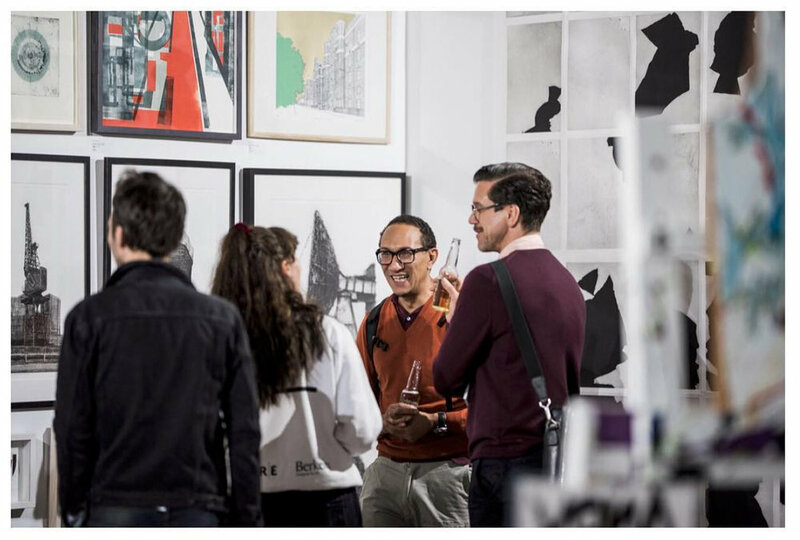 The Fair boasts a huge array of contemporary print and showcases some of the most exciting new work across the various disciplines. It was hugely exciting to be part of this event. The event takes place over a weekend and features live printing events and artist led talks. Me peering up at my piece on the opening night. The opening night of the show with my entry just in shot. 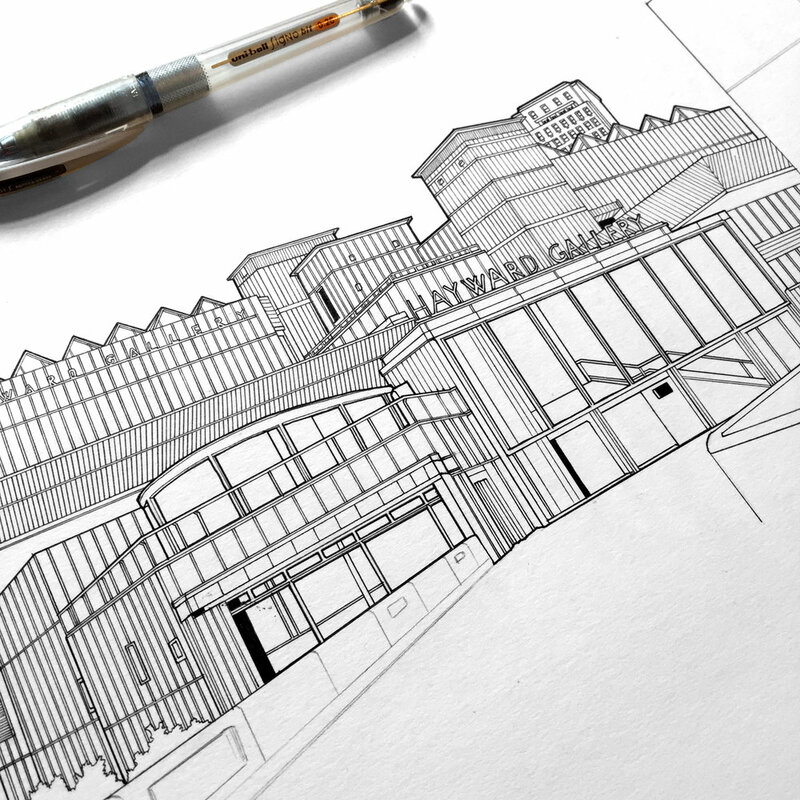 Work in progress taken from a commission illustrating the Bargate development in Southampton. All artwork and images are property of Will Clarke.